Good thing, he has his own eloquent ways of telling me how silly I’m being. He’ll start by putting on his warmest, kindest smile and slowly slipping my hand into his. Then he’ll lure me into a conversation, this particular time with the promise of a story. Who doesn’t love a good story? Especially with some warm tea? Never mind the somewhat bitter less than perfect brew. It turned out to be a story about a princess and a dragon. The dragon, sweet and charming, would do anything for the princess, but the princess was set on making his life miserable. It wasn’t hard to see that the princess was being unfair to the poor dragon and being unreasonable in general even though she was using the same words I did, just minutes ago, verbatim. Not to mention the same tone. I guess it’s easier to see other’s mistake, even if it’s a fictitious princess having a conversation with a fictitious dragon, using your very vocabulary. I’m not sure if the princesses’ poorly masked masculine voice helped with the realization but the simultaneous laughing-snorting-tea-spilling was inevitable. 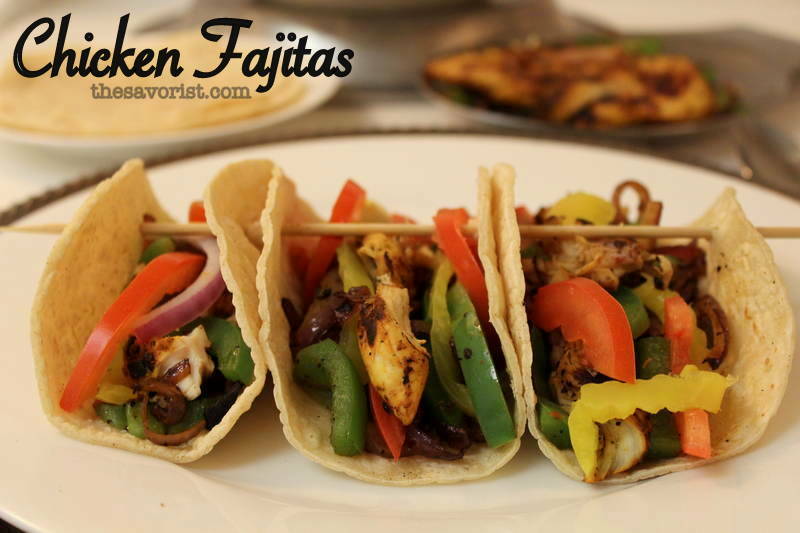 Chicken fajitas are my favorite go-to healthy non-boring dinner option. They are extremely easy to put together; are healthy (if you go easy on the sour cream & cheese); you can customize them with the endless topping options and they are gluten-free if you pick corn tortillas. The only real technique behind great fajitas is to quickly sear the chicken at a high temperature on a griddle/pan/grill, slice and serve with seared bell peppers and onions on warm tortillas. I have come to realize that cast iron skillet works best for searing the meat, and nonstick pans don’t deliver on the taste front. 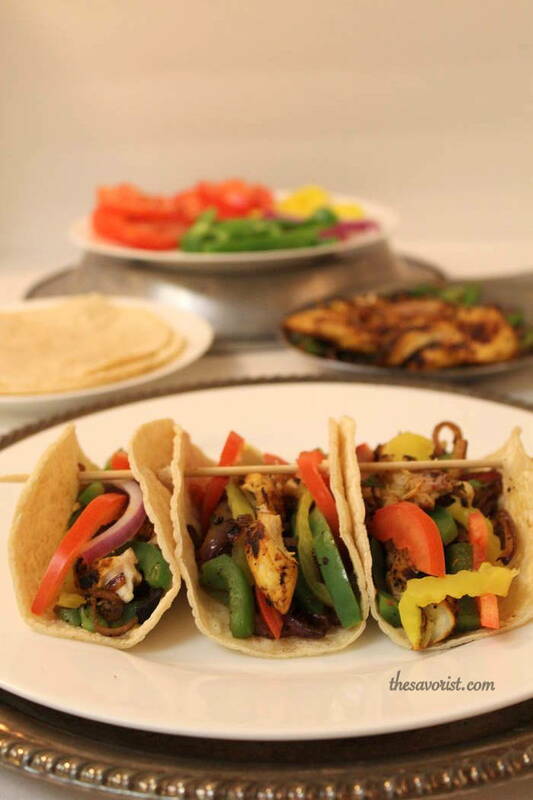 The word ‘Fajita’ comes from the Spanish word ‘faja’ which means ‘strips’. 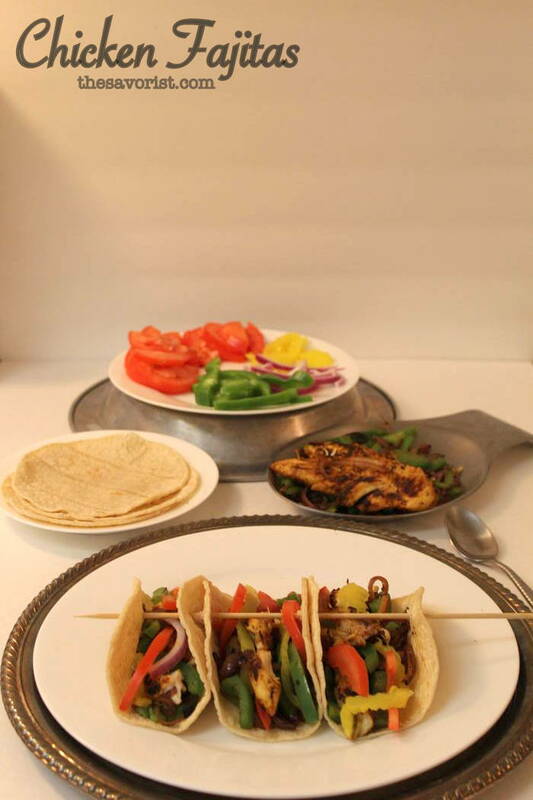 Chicken fajitas are marinated chicken strips seared on high heat served with stir fried onions and bell peppers, on warm tortillas with a side of toppings and hot sauce. It is an American-Mexican fusion cuisine. 1. If the chicken breasts you are using are thick, slice them in half parallel to the chopping board (Do not pound the chicken breast). I recommend using whole chicken breasts rather than chicken strips since it’s easier to sear the whole breast and slice them once they are done. 2. Mix all the marinade ingredients together in a bowl. Add the chicken, mix well, cover and refrigerate for at least 1 hour, preferably 5-6 hours or overnight. Take them out at least 30 minutes before cooking, so they are at room temperature. 3. Remove the chicken from the marinade. Let the excess marinade drip off. 4. Heat a large cast-iron skillet over high heat. Add a tablespoon oil. Once the oil is hot lay the chicken breast pieces in the pan away from you. Let the chicken cook undisturbed for 3 minutes, till you have a good sear. Once seared well on one side, turn the pieces over and cook for another 2-3 minute. Do not keep flipping the chicken. 5. Once the chicken pieces are seared on both the sides remove on a plate and let them rest. Stack them up so they don’t dry out. It’s a goof idea to check a piece by slicing them to see if they are cooked all the way through. Chicken shouldn’t be pink. 6. Once the chicken is done add another tablespoon of oil to the same frying pan. Once the oil is hot, add the onions and saute for 1-2 minute. Add chopped bell peppers in the end so they remain crunchy, and turn the heat off. Note: For the gluten-free option make sure you double-check the ingredients list on corn tortillas, as a lot of them have added wheat flour. They look absolutely amazing. Very ideal for a quick lunch. Thanks for sharing! Oh yes, lunch/dinner anything. And they are very easy to put together too. 🙂 Thanks for dropping by. I’m not sure if I like the story or the fajitas the best!! If my husband saw this post then I’m sure I would be getting my own princess/dragon story lol! Scrumptious! I love this kind of food.